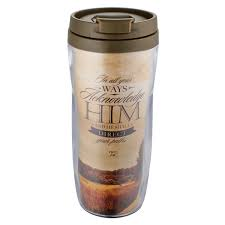 The Proverbs 3:6 Polymer Travel Mug, with a country road image insert, has a pop-up open / close lid. The contoured shape of the body and the non-slip base make for comfortable and secure handling. Fits most car and truck beverage holders. Features stylized text In all your ways acknowledge Him and He shall direct your paths. Proverbs 3:6 on both the front and back. BPA Free / Food Grade Safe 360mL.